Archives : SLUGGISH UPMOVE CONTINUES - 24/12/2010. SLUGGISH UPMOVE CONTINUES - 24/12/2010. FIGHT BETWEEN THE SHORT TERM AND MEDIUM TERM TREND. The week gone by, can be appropriately summed up as not only sluggish but an almost listless week as many market participants were in a festive mood. The main reason behind this, was the fight between the short term and medium term trend. As the market managed a close above the 20dma last week, the short term trend had turned positive, but since the market was below the 50dma, the medium term trend was down. Hence the entire last week was primarily the fight between the short term and the medium term trend. As a result the market remained subdued while still being in a small range. The Sensex opened the week at 19770, made a high of 20151, a low of 19711 and closed the week at 20073. The Sensex gained 209 points on a weekly basis. Similarly Nifty opened the week at 5926, made a high of 6023, a low of 5900 and closed the week at 6011. The Nifty too closed with a gain of 63 points on a weekly basis. After forming a Bullish Harami reversal pattern last week, this week both the indices have formed a Big White Body candle which is in continuation with the Bullish reversal observed last week. On the daily charts both Sensex and Nifty have formed a Bullish Engulfing and which increases the possibility of a stronger upmove in the near term. The market is above the 20dma (Sensex – 19763 and Nifty – 5926) and as a result the short term trend is positive. The market is just testing the 50dma, infact the Sensex has just managed a close above the 50dma, and the Nifty is just below the 50dma (Sensex – 20028 and Nifty – 6018) and hence the fight for the medium term trend continues. However both the indices are still above their 200dma (Sensex – 18495 and Nifty – 5552) and hence the long term trend still continues to remain positive. In the immediate future, the first resistance for the Sensex will be at 20217, which was the intermittent high and 6069 for the Nifty. Just above this level, lies the 61.8% retracement, as shown above. Hence the Sensex will face the resistance in the zone of 20217-20285 and the same for the Nifty will be 6069-6090. Both the indices have formed a bottom at Sensex 18954 and Nifty 5690. This bottom was tested when the indices went lower (Sensex 19074 and Nifty 5721) without breaching it. Hence in the short term Sensex 18954 and Nifty 5690 assumes lot of significance. The long term trend will remain intact as long as Sensex 17819 and Nifty 5348 remains intact. In the short term both Sensex and Nifty have formed a Flag formation and a breakout is in place and the immediate target will be at Sensex 20316-20598 and Nifty 6087-6185. Majority of the oscillators are in Buy mode. MACD for the Sensex is in Buy mode and has just turned positive. ROC has also signaled a Buy and continues to stay above the centerline. RSI (54), too is in Buy mode. Money Flow Index is at 53 and is in Buy mode and the OBV continues to move higher, while still being in Buy mode. The ADX is at 23, suggesting that the trend is getting weaker. The Directional Indicators are in Sell mode as -DI continues to be above +DI, but they are converging. The O.I. PCR is improving and is currently at 1.50. This is due to the increase in confidence of the Put writers. For the January series, highest Open Interest build up is seen at 6300 Call and 5800 Put. The Option writers expect trading range between 5800-6300 for the next month series. On Friday, just as the Nifty managed a close above 6000, very high open interest has been added to the 6000 Put, suggesting that the Put writers expect some support to come in at 6000 levels. 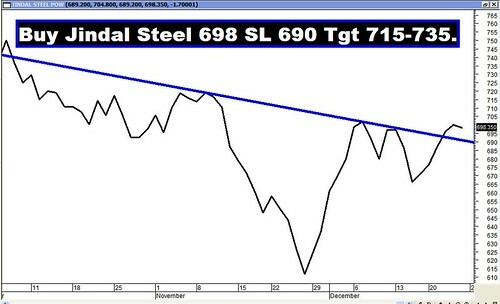 The Trendline Support for the Sensex is at 19590 and for the Nifty 5875. For the week ahead, Sensex will find Support at 19877-19687-19423 and will find Resistance at 20267-20452-20669. For the week ahead, Nifty will find Support at 5963-5908-5855 and will find Resistance at 6084-6151-6222. LAST WEEKS RECOMMENDATIONS: Almost all the recommendations reached their targets except for Aurobindo Pharma and Chennai Petro which just missed their respective targets by a couple of rupees. The Star performer for the week was TCS.